Skydive SanFrancisco. The Only place to skydive! 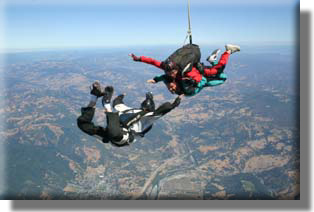 Skydive San Francisco has one of the best video and photo services in Northern California. With high quality digital video and high resolution digital still photos we can capture your entire skydive experience! Just a few minutes after you land you will be watching an amazing, professionally-edited video that you will cherish forever! "Call now for your skydiving adventure (415) 251-6358"
We have several different packages for you to choose from. You can choose to get a video only, still photos only (approx. 150-200 shots) or both. Your High Definition video comes on a DVD and we can upload it to Youtube for you. Check out our Video FAQ here.